Definitive illustrated book to help you see how to pick a variety of locks. 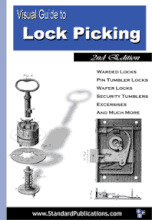 Primarily written for the beginner with step by step instructions to pick the most common locks. There are sections for warded locks, pin tumblers, wafer tumblers, tubular locks, padlocks, and more. Illustrates how to use lock picking tools with expanded section on tubular locks. Now you can get accurate information the professionals use to give you the edge. Step by step instructions are given for picking each kind of lock. This unique lock picking book even gives you exercises to help hone your skills.